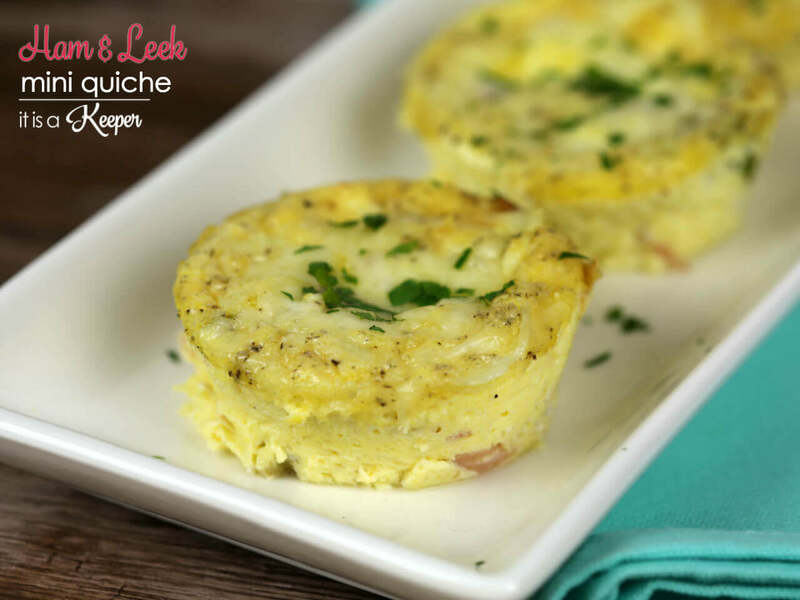 These mini Ham and Leek Quiches are an easy make-ahead breakfast recipe the whole family will love! With the back-to-school season upon us, mornings in our house are about to get crazy. We are not what you would call “morning people”. We all love to sleep in so getting up and ready to school and work is always a challenge. One thing that helps make our mornings run more smoothly are easy breakfast choices. Whether it’s a quick-fix meal, a homemade freezer breakfast or a make-ahead option, getting a jump-start on breakfast really moves things along. 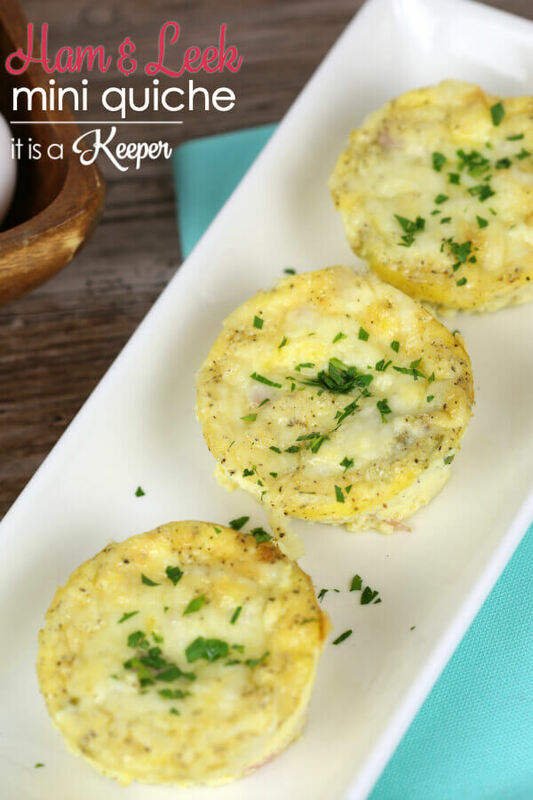 I love that these mini quiches are super easy to make. 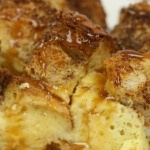 With only a few simple ingredients, they are ready in under 20 minutes if you want to make them in the morning. Or, better yet, you can make them the night before and quickly reheat them. Breakfast doesn’t get more simple than that! I have discovered a new found love for leeks. If you’ve never tried them, you should definitely give them a go. I love the light onion-y flavor that leeks give to whatever you put them in. Leeks are perfect for this recipe. They add a great layer of flavor to the quiche. However, if leeks aren’t your thing (I won’t hold it against you), you could always use scallions, shallots or any other veggie that your family likes. In fact, I think next time I make these I’m going to try spinach or broccoli. Or, maybe both! 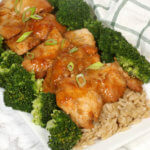 That’s what I love about this recipes — it’s really pretty flexible. You can swap out any of the ingredients for choices your family likes. This is also a great breakfast option if you’re trying to watch your carb intake. Because there is no crust, like traditional quiche has, this recipe is virtually carb free. Lately, I’ve been trying to incorporate more organic ingredients into our meals. Today, so many foods have ingredients that you can’t even pronounce. Between preservatives, stabilizers and artificial flavors and colors, our food is turning into a science project. I’m trying to give my family more whole foods. 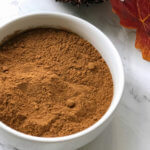 Foods that are found in nature – unprocessed, real ingredients that don’t have additives and crazy ingredients. I discovered that my local Giant supermarket has an entire line of organic ingredients called Nature’s Promise®. 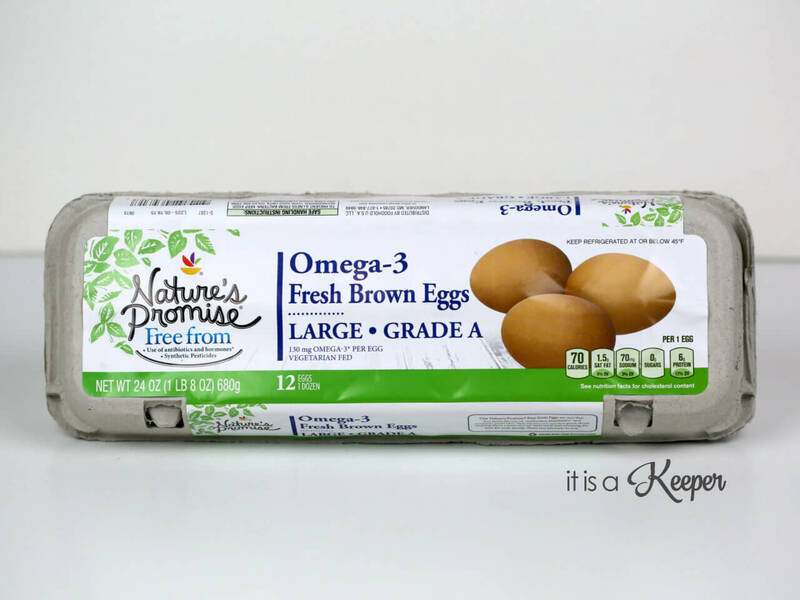 Giant’s Nature’s Promise brand are organic products meet all USDA certification requirements. 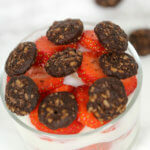 And, they are free from nonessentials such as, artificial colors, artificial flavors, and artificial preservatives. This means you can feel good about making them a part of your next meal and ensuring the best for your family. 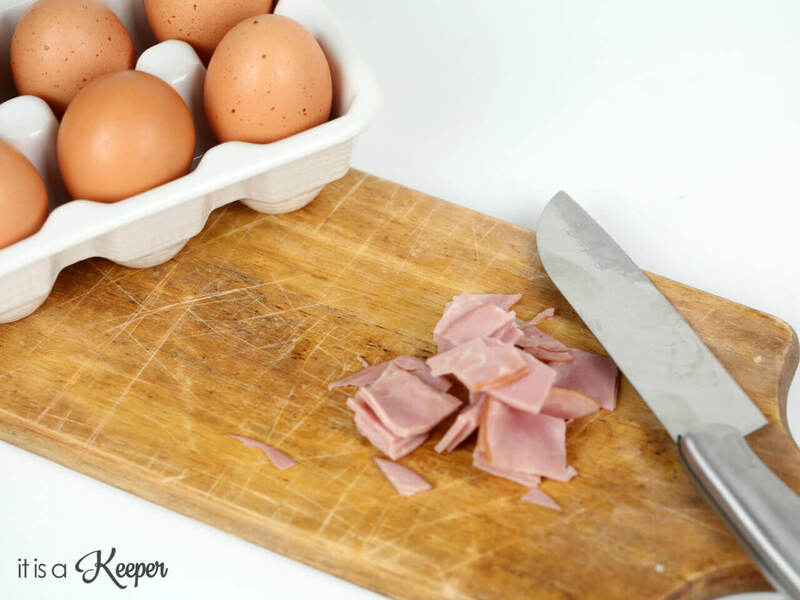 In this recipe, I used Nature’s Promise® eggs and ham that I picked up at my local Giant supermarket. 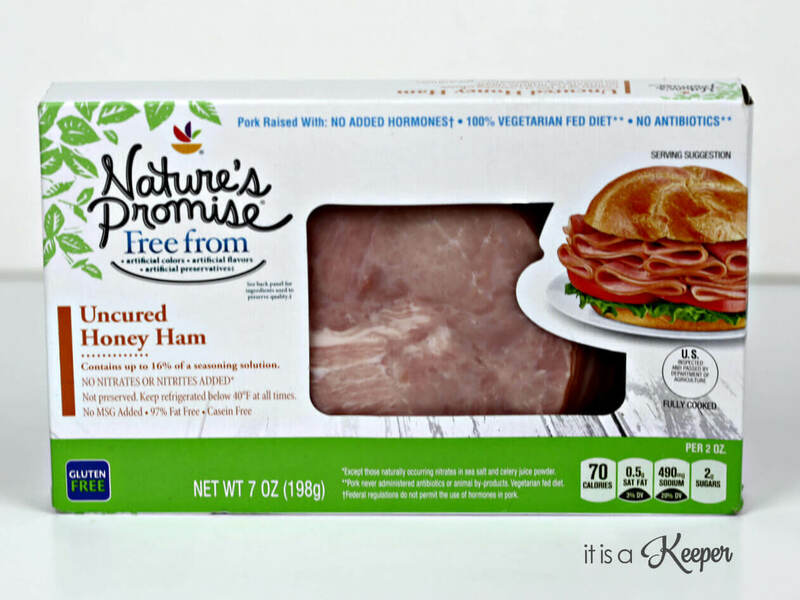 Nature’s Promise products include only what nature intended. They are free from nonessentials such as, artificial colors, artificial flavors, and artificial preservatives. And, the best part is, they are reasonably priced. With the Nature’s Promise brand, I can easily incorporate more organic ingredients into my recipes. 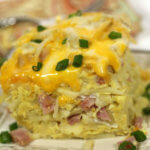 Giant offers options for the ingredients I use most — such as the eggs and ham in this recipe. You can even get special offers on Nature’s Promise product. Load Offers for Nature’s Promise Products To Your Giant Card Here. Using mobile? Click here to load offers. Melt the butter in a skillet over medium heat and add the leeks. Cook leeks until lightly browned, about 4 to 5 minutes. 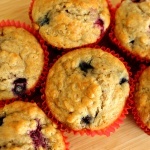 Cool slightly, then divide them evenly among the muffin cups. Whisk the half-and-half, eggs, salt and pepper in a medium bowl; stir in the ham. 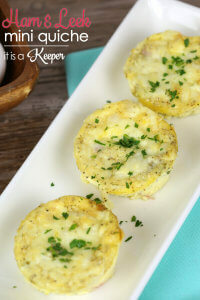 Fill the muffin cups two-thirds full with the egg mixture and top with the grated cheese. Bake until set, 12-15 minutes. Let cool for 5 minutes, then remove them from the tin.